Happy Fall!! Not sure about you guys but it hasn't been feeling to much like fall lately, and its October! I can't bring myself to even put up a post of a jacket or a scarf...even though I want too trust me. Which brings me to my next favorite wardrobe staple of mine..the longline vest. I love this vest because you can wear it so many different ways! 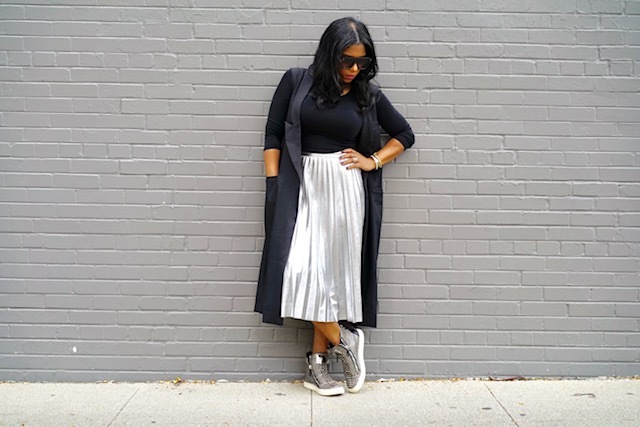 I paired it with denim, my fav silver skirt, and also a wide leg pant. All super easy and super fashionable and chic. And that's what we want! Check it out! I am in love with all these looks! The vest I have here is actually sold out. I found another one for you guys here and here . This vest is a must have for the fall season. It is such a seasonless piece, I vote this as a must have for your wardrobe! I would love to see what you guys like to pair with your vest's this season! !